There is something special about telling someone you care about just how much they mean to you. This collection of friend card, notepad and bookmark says it all. 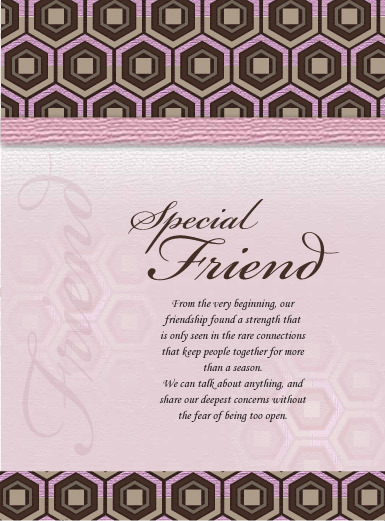 Friend greeting card with a warm message about true friendship. The notepads include a laminated hard cover with a verse. The notepad itself has a faded version of the front graphic design and a short inspirational note at the bottom of each page. There are 40 tear away sheets in the notepad. A heartfelt friend bookmark comes in a plastic sleeve for safe keeping. The card fits perfectly inside our greeting card as an added gift.